Cholera terrified and fascinated nineteenth-century Europeans more than any other modern disease. Its symptoms were gruesome, its sources were mysterious, and it tended to strike poor neighborhoods hardest. In this insightful cultural history, Catherine Kudlick explores the dynamics of class relations through an investigation of the responses to two cholera epidemics in Paris. While Paris climbed toward the height of its urban and industrial growth, two outbreaks of the disease ravaged the capital, one in 1832, the other in 1849. Despite the similarity of the epidemics, the first outbreak was met with general frenzy and far greater attention in the press, popular literature and personal accounts, while the second was greeted with relative silence. 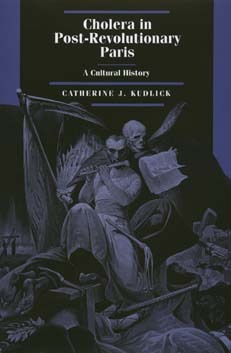 Finding no compelling evidence for improved medical knowledge, changes in the Paris environment, or desensitization of Parisians, Kudlick looks to the evolution of the French revolutionary tradition and the emergence of the Parisian bourgeoisie for answers. Catherine J. Kudlick is Assistant Professor of History at the University of California, Davis.